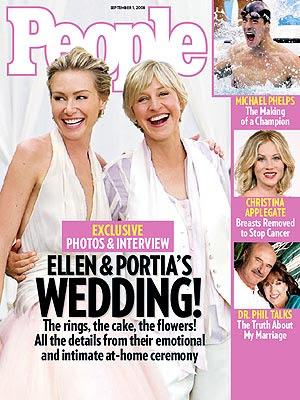 Congratulations and best wishes to Ellen Degeneres and Portia de Rossi on their marriage yesterday in Malibu. 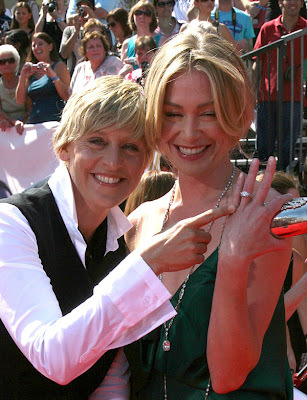 After Ellen's infamous relationship with Anne Heche who tried out the lesbian lifestyle for a bit and then turned batshit crazy, we're so happy that Ellen found an amazing partner in de Rossi. Kudos to Portia for her outstanding roles on Ally McBeal, Arrested Development, and Nip/Tuck. She totally rocks. Ironically, crazy Anne Heche also appeared on Nip/Tuck back when Christian and Sean were still in Miami, but we digress. Hopefully the quote from today's New York Times about how being gay and single is like the new smoking will not cast a shadow on the happy newlyweds. Mazel tov.